Although Google had already hit Antarctica, this remote Canadian town is the most remote destination yet to make it into Street View, thanks to an intrepid staffer on a tricycle. Google has taken its StreetView cameras to the Arctic to map the small Canadian town of Cambridge Bay, Nanavut. Google said the small Inuit town, with a population of just 1,500, is one of the most remote locations it has covered. The company used its StreetView tricycle to map Cambridge Bay and the pictures will be online in a few months. 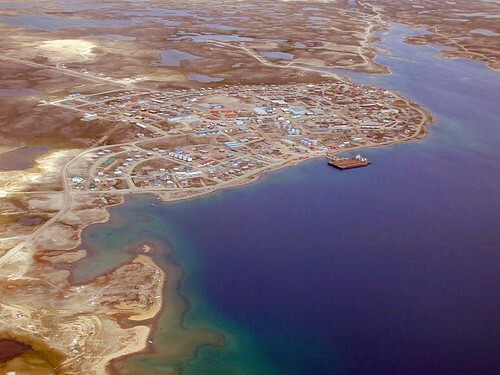 Aerial view of Cambridge Bay, Nunavut. Photo by Alan Sim. In 2010, Google took StreetView to Antarctica, extending the service to cover all of the world’s continents. Earlier this year, the search engine photographed the Antarctic huts of explorers Scott and Shackleton. Launched in 2007, Google’s StreetView service has occasionally been controversial, with some countries expressing concern about the privacy of people who are caught by its cameras – usually without their knowledge. Last month, Google admitted that it had failed to delete the data it collected over open WiFi networks in Britain while its StreetView cars were mapping the country. Google had repeatedly given assurances that it had deleted the data.